The Memphis Grizzlies are the Bulls’ kind of Western Conference team. They don’t score much or shoot well and can’t make threes. They like to run down the clock until they have to force up a contested shot, but they’re willing to give you a shot of another sort. Yeah, they can play those guys. And the Bulls did Monday, winning 95-91 in Memphis, marking their first road win this season over a Western Conference team with the Grizzlies failing to make a three-point shot, matching the Bulls’ 21 turnovers and battling the Bulls to a draw on the backboards. Any win, really, for this Bulls team that had lost 12 of 14 in Memphis but inched to 12-17 overall this season, now a tie for eighth in the Eastern Conference with the Detroit Pistons. And a half game behind the Boston Celtics, who are at the United Center Thursday. Dare we say statement game? We’re No. 8! But actually 22nd in the overall league standings. Forget that. Because the Bulls made a statement of sorts Monday with a grind-it-out win in the arena known as “the grind house” by Memphis players and fans. Though that’s more reminiscent of recent, more physical teams coached by Lionel Hollins. This one is a bit betwixt and between with center Marc Gasol out and a new coach. Actually, grind house to those of us from New York City was the term used for the sleazy, dive theaters on Times Square. So don’t let me get started on downtown Memphis. Or going downtown with the three ball, which actually saved this one. And by the Bulls of all teams as D.J. Augustin hit a pair of three-pointers in the fourth quarter after the Grizzlies came back from 18 behind in the third quarter to trail 72-71 with nine minutes remaining. Augustin, who has been terrific since being picked up after being released by Toronto and had 10 points and nine assists, confidently stepped into a three when Tony Allen went under a Taj Gibson screen. That gave the Bulls 75-71 breathing room. But the Grizzlies finally seemed to have awakened from their hibernation and got back within 78-76 on seven straight points basically on drives and free throws from former Bull James Johnson, recently picked up from the D-League. Augustin, meanwhile, also has emerged as the Bulls best shooting threat. In fact as he played with a fourth quarter group of Joakim Noah, Gibson, Jimmy Butler and Kirk Hinrich, Augustin was about the only one even looking for a jump shot. The Bulls got caught in another of what seemed like dozens of these possessions with the inside closed off and the ball moving lazily around as no one seemed to much want to shoot. It’s a full time job now yelling “five” from the Bulls bench to signal the time left on the shot clock. Butler got cut off, lost the ball and saved it from going out of bounds back to Noah. He threw to Hinrich on top who quickly threw to Augustin in the right corner with about eight seconds on the clock. Augustin began to dribble left into the middle, losing the ball off Jerryd Bayless. But Augustin raced back to get it at the midcourt line with about five seconds. He took a quick look up at the shot clock, dribbled back down the right sideline and pulled up for a falling down three at the buzzer as Bayless’ shoulders slumped in despair. The Bulls went ahead 81-76 with 5:52 left. Augustin, who is generally quiet and reserved, then talked back to a lineup of fat guys sitting in the front row who were taunting him as he shot the ball. 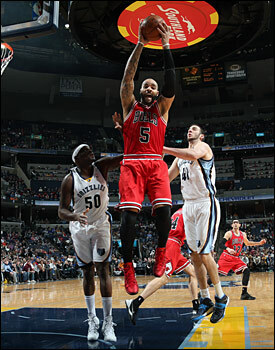 Boozer had 21 points and 10 rebounds. He has a career average of more than 20 per game against the Grizzlies, his best against any team. You could even see the fans sink like they’d run out of bar-b-que bologna and smoked chicken thighs at the Pig on Beale Street. No, not the fans. The restaurant. Johnson, with the same great speed and shooting bricks Bulls fans remember, kept the Grizzlies hanging in with two more free throws just before he fouled out with 13 points and 10 rebounds running into Hinrich after a Zach Randolph miss. Hinrich was being a bit of a reluctant shooter, though Jason Kidd-like with defense and court play. After Hinrich made one of two and Randolph missed again against a continuing fierce defensive effort on him by Noah, Augustin dribbled out of the backcourt and set up the offense. He handed off to Butler on top. Augustin then exchanged positions going into the left wing and taking a pass back from Butler and dribbling toward the basket down the left side. As the defense closed, Augustin fired a pass to Hinrich in the right corner and Hinrich made his first field goal of the game. It was a three with 3:35 left to give the Bulls an 88-78 lead. They hung on with a few free throws in the last minute to get the victory. It’s pretty clear now there’s no easy opponent for the Bulls. It will help when Luol Deng returns from Achilles issues, perhaps as soon as Tuesday at home against Toronto. In the meantime, the Bulls will need these 48-minute sort of efforts. Thibodeau talks about that all the time, though he means ideal play for 48 minutes. There is no such thing, and certainly not with this Bulls team. They are fallible in their passionate play, though hardly feckless. It’s an imperfect combination of talent with too little shooting and often too much imagination. The Bulls committed 21 turnovers. Memphis was accommodating with 21 of their own, though hardly of their own volition as the Bulls defense with season highs in steals and blocks had more to do with that. But with the Bulls little threat from the perimeter, teams continue to sag in the middle, disrupting the innovative passing of their big men. So that often becomes turnovers. Mistakes? Perhaps, though more of commission, of trying to do something for someone else. It’s an unusually unselfish group, which without the prerequisites of enough shooting tends to backfire at times. Though it hardly seems worth changing. So the Bulls got a season best 26 points from Jimmy Butler, including 12 of 14 free throws even as Butler was uncertain to play after aggravating his turf toe injury against Dallas Saturday. 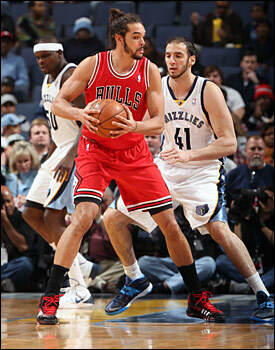 Noah and the Bulls’ 96-91 victory in Memphis was Chicago’s first road win this season over a Western Conference team. Butler was making them, especially scoring 14 points in the third quarter, which the Bulls opened with a 20-4 blitz that gave them a 66-48 lead with 3:19 remaining in the third quarter. That third quarter run was fueled by back to back threes from Butler and strong play by Carlos Boozer, who had 21 points and 10 rebounds. Boozer has a career average of more than 20 per game against the Grizzlies, his best against any team. Butler also had a lob slam dunk on a pass from Hinrich. And if you didn’t know it was the Bulls you’d think it was over. But this Bulls team cannot sustain offense. Though defense got them a bit, too, when Thibodeau took out Hinrich with the Bulls ahead by 18. The Bulls are trying to limit Hinrich’s playing time, especially now that Augustin signed. And though Augustin has proven invaluable, there are reasons he’s drifted around and been cut. As soon as he replaced Hinrich, Conley, who led Memphis with 26 points and nine assists, went right at the shorter Augustin. Conley scored on a pair of three-point plays, one when Conley suckered Augustin into fouling him on a jump shot. Though Augustin is a smart veteran, it still is surprising to see so many small guards try to block jump shots and then foul shooters. And Augustin was another. Conley added a pair of free throws to get Memphis within 71-64 after three. 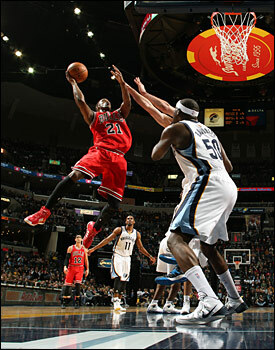 Then the Grizzlies opened the fourth quarter with a 4-1 start with Conley getting two baskets to get within 72-68. Thibodeau got Hinrich back in. Hinrich had been terrific against Conley, going over screens and bumping the lighter Conley. And if not getting over the screen, racing ahead before Conley could find a shot. It was classic guard defensive play and Conley had been just two of 10 for six points before Hinrich took a break late in that third quarter and Conley drove the Grizzlies back. Thibodeau said before the game he knew his father, a big basketball fan, would have wanted him to be back with his team. Thibodeau even drew a technical foul in the fourth quarter. But Thibodeau also was on his game as well. Thibodeau put Hinrich back on Conley. But Thibodeau smartly left in Augustin as the Bulls were having trouble freeing Mike Dunleavy for shots. Memphis also is a very good defensive team and closes on threes well. Augustin went to defend Tony Allen. The Grizzlies tried to go at Augustin as well with Allen. But Allen’s an awkward and inefficient offensive player. Hinrich even caught him on a fast break to block his shot. But the pairing of Augustin with Hinrich opened the court for the Bulls. Significantly, it also enabled Augustin to make those big threes that stalled Memphis’ comeback. It wasn’t a particularly high level early as the teams combined for 13 first quarter turnovers and the Bulls had nine turnovers to seven field goals in falling behind 22-17 after one. The Bulls had three in their first five possessions and took almost four minutes to score. But they got a big lift off the bench in the second quarter from Gibson and Tony Snell. And with Noah working relentlessly against Randolph, holding him to four of 15 shooting for the game. The Bulls led 46-44 at halftime and then gained enough margin to hang on thanks to Butler’s aggressive play. They say you can have fun in Memphis even if you’re not Elvis. And the Bulls did for a change instead of staying at their heartbreak hotel.